Noam Chomsky on progressive reform, Fidel Castro, and building resistance under Donald Trump. 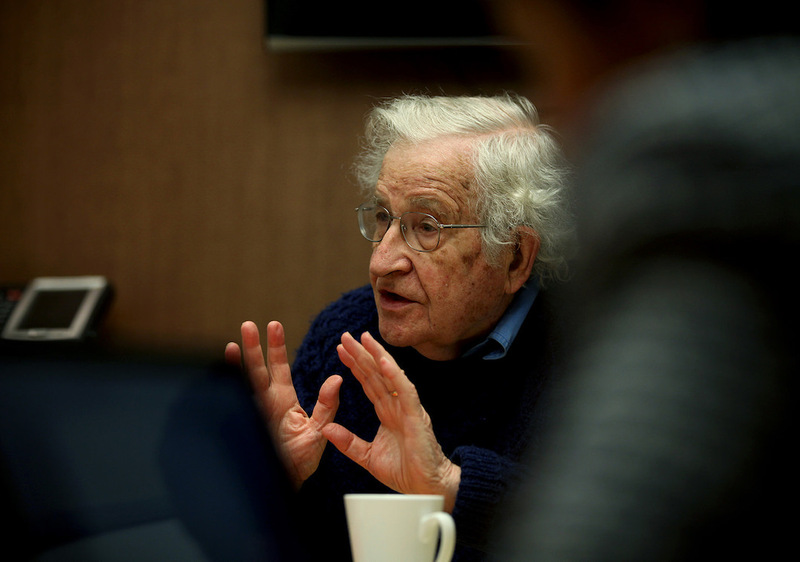 As he approaches ninety years old, Noam Chomsky’s bibliography just keeps expanding. Fortunately for the international left, he also continues giving interviews. How should socialists think about the relationship between reforms that humanize the existing system of production (as proposed by Sanders) and the long-term goal of abolishing capitalism altogether? Well, first of all we should recognize that, like most terms of political discourse, socialism has more or less lost its meaning. Socialism used to mean something. If you go back far enough, it meant basically control of production by producers, elimination of wage labor, democratization of all spheres of life; production, commerce, education, media, workers’ control in factories, community control of communities, and so on. That was socialism once. But it hasn’t meant that for a hundred years. In fact, what were called the socialist countries were the most anti-socialist systems in the world. Workers had more rights in the United States and England than they had in Russia, and it was somehow still called socialism. As far as Bernie Sanders is concerned, he is a decent, honest person, and I supported him. What he means by socialism is New Deal liberalism. In fact, his actual policies would not have been a great surprise to General Eisenhower. The fact that this is called a political revolution is a sign of how far to the right the political spectrum has shifted, mainly in the last thirty years, since the neoliberal programs began to be instituted. What he was calling for was a restoration of something like New Deal liberalism, which is a very good thing. So, going to your question, I think we should ask: should people who care about human beings, and their lives and concerns, seek to humanize the existing system of production by the means you describe? And the answer is, sure they should do that, that’s better for people. Should they set out the long-term goal of abolishing capitalist economic organization altogether? Sure, I think so. It’s had its achievements, but it is based on quite brutal assumptions, anti-human assumptions. The very idea that there should be a certain class of people who give orders by virtue of their ownership of wealth and another huge class who take orders and follow them because of their lack of access to wealth and power, that’s unacceptable. So, sure it should be abolished. But those are not alternatives. Those are things you do together. One of the main arguments used against socialism is that human nature is by definition selfish and competitive, and hence is only conducive to capitalism. How would you respond? Bear in mind that capitalism is a tiny period of human society. We never really had capitalism, we always had one or another variant of state capitalism. The reason is capitalism would self-destruct in no time. So the business classes have always demanded strong state intervention to protect the society from the destructive effect of market forces. It’s often business that it’s in the lead, because they don’t want everything destroyed. Do you think it’s necessary to sketch out concrete proposals for a future socialist order, creating a solid alternative that appeals to the majority of people? I think people are interested in authentic long-term socialist goals (which are not what is usually called socialism). They should be thinking through carefully how the projected society should work, not in extensive detail, because a lot of things just have to be learned by experiment, and we don’t know enough to plan societies in detail by any means. But general guidelines could be worked out, and many of the specific problems can be discussed. And that should just be part of people’s popular consciousness. That’s how a transition to socialism could take place. When it becomes part of the awareness, consciousness, and aspirations of the large majority of the population. So, take for example one of the major achievements in this direction, maybe the major one: the anarchist revolution in Spain in 1936. There had been decades of preparation for that: in education, in activism and efforts — sometimes beaten back — but when the moment came with the fascist attack, the people had in their minds the way they wanted the society to be organized. We have seen it in other ways, too. Take, say, Europe’s reconstruction after the Second World War. The Second World War had really devastating effects for much of Europe. But it really didn’t take them very long to reconstruct state capitalist democracies because it was in people’s heads. There were other parts of the world that were pretty much devastated, and they couldn’t do it. They didn’t have the conceptions in their mind. A lot of it is human consciousness. Syriza came to power claiming a commitment to socialism. But they ended up cooperating with the European Union, and didn’t step down even after they were forced to implement austerity. How do you think we can avoid a similar outcome in the future? I think the real tragedy of Greece, aside from the savagery of the European bureaucracy, Brussels bureaucracy, and Northern banks, which was really savage, is the Greek crisis didn’t have to erupt. It could have been taken care of pretty easily at the very beginning. But it happened, and Syriza came into office with a declared commitment to combat it. In fact they actually called a referendum, which horrified Europe: the idea that people should be allowed to decide something about their own fate is just anathema to European elites — how can democracy even be permitted (even in the country where it was created). As a result of this criminal act of asking people what they want, Greece was punished even further. The demands of the Troika got much harsher because of the referendum. They were fearing a kind of domino effect — if we pay attention to people’s desires, others might get the same idea, and the plague of democracy might actually spread, so we have to kill it right away at the roots. Then Syriza did succumb, and ever since then they have done things that I think are quite unacceptable. You ask how people should respond? By creating something better. It’s not easy, especially when they are isolated. Greece, alone, is in a very vulnerable position. If the Greeks had had support from progressive left and popular forces elsewhere in Europe, they might have been able to resist the demands of the Troika. What is your opinion of the system Castro created in Cuba after the revolution? Well, what Castro’s actual goals were, we don’t actually know. He was sharply constrained from the first moment, by a harsh and cruel attack from the reigning superpower. We have to remember that literally within months after his taking office, the planes from Florida were beginning to bomb Cuba. Within a year, the Eisenhower administration, secretly, but formally, determined [the US would] overthrow the government. Then came the Bay of Pigs invasion. The Kennedy administration was furious about the failure of the invasion, and immediately launched a major terrorist war, economic war that got harsher through the years. Under these conditions it is kind of amazing that Cuba survived. It is a small island right offshore of a huge superpower which is trying to destroy it, and obviously depended on the United States for survival all of its recent history. But somehow they survived. It was true that it was a dictatorship: a lot of brutality, a lot of political prisoners, a lot of people killed. Remember, the US attack on Cuba was ideologically presented as necessary to defend ourselves from Russia. As soon as Russia disappeared, the attack got harsher. There was almost no comment on that, but it tells you that the preceding claims were just an outright lie, as of course they were. If you look at US internal documents, they explain very clearly what the threat of Cuba was. So back in the early ’60s, the State Department described the threat of Cuba as Castro’s successful defiance of US policy, going back to the Monroe Doctrine. The Monroe Doctrine established the claim — they couldn’t implement it at the time, but the claim — to dominate the Western Hemisphere, and Castro was successfully defying that. That’s not tolerable. It is like somebody saying, let’s have democracy in Greece, and we just can’t tolerate that, so we have to destroy the threat at its roots. Nobody can successfully defy the master of the hemisphere, in fact of the world, hence the savagery. But the reaction was mixed. There were achievements, like health, literacy, and so on. The internationalism was incredible. There is a reason why Nelson Mandela went to Cuba to praise Castro and thank the Cuban people almost as soon as he got out of jail. That’s a Third World reaction, and they understand it. Cuba played an enormous role in the liberation of Africa and the overthrow of apartheid — sending doctors and teachers to the poorest places in the world, to Haiti, Pakistan after the earthquake, almost everywhere. The internationalism is just astonishing. I don’t think there has been anything like it in history. The health achievements were astonishing. Health statistics in Cuba were about like the United States, and take a look at the differences in wealth and power. On the other hand, there was a harsh dictatorship. So there was both. Transition to socialism? We cannot even talk about this. The conditions made it impossible, and we don’t know if there was an intention. In recent years, several movements have sprung up in the US criticizing the current form of social and economic organization. Nevertheless, most of them have united against a common enemy, instead of uniting around a common vision. How should we think about the state of social movements and their ability to unite? Let’s take the Occupy movement. Occupy was not a movement, it was a tactic. You can’t sit forever in a park near Wall Street. You can’t do it for more than a few months. It was a tactic I had not predicted. If people had asked me, I would have said, don’t do it. But it was a great success, an enormous success, with a big impact on people’s thinking, on people’s action. The whole concept of concentration of wealth (1 percent and 99 percent), it was there of course, at the background of people’s understanding, but it became prominent — even became prominent in the mass media (in the Wall Street Journal, for example) — and it led to many forms of activism, it energized people and so on. But it wasn’t a movement. The Left, in a general sense, is very much atomized. We live in highly atomized societies. People are pretty much alone: it’s you and your iPad. The major organizing centers, like the labor movement, have been severely weakened, in the United States very severely, by policy. It didn’t happen like a hurricane. Policies have been designed to undermine working-class organization, and the reason is not only that unions fight for workers’ rights, but they also have a democratizing effect. These are institutions in which people without power can get together, support one another, learn about the world, try out their ideas, initiate programs — and that’s dangerous. That’s like a referendum in Greece. It’s dangerous to allow that. We should recall that during the Second World War and the Depression, there was an upsurge in popular, radical democracy, all over the world. It took different forms, but it was there, everywhere. In Greece it was the Greek revolution. And it had to be crushed. In countries like Greece, it was crushed by violence. In countries like Italy, where the US/ British forces entered in 1943, it was crushed by attacking and destroying the anti-German partisans and restoring the traditional order. In countries like the United States, it was crushed not by violence — capitalist power doesn’t have that capacity here — but starting in the late ’40s, huge efforts were undertaken to try to undermine and destroy the labor movement. And it went on. It picked up sharply under Reagan, it picked up again under Clinton, and by now the labor movement is extremely weak (in other countries, it’s taken different forms). But that was one of the institutions which did let people come together to act cooperatively and with mutual support, and others have been pretty much decimated as well. What can we expect from Donald Trump? Does his rise provide ground for redefining and uniting a socialist movement around a common vision in the United States? The answer to that is basically up to you and your friends. It really depends on how people, especially young people, react. There are plenty of opportunities, and they could be taken. It is not inevitable by any means. Just take what is likely to happen. Trump is highly unpredictable. He doesn’t know what he plans. But what might happen, for example, one possible scenario is this: a lot of people who voted for Trump, working-class people, voted for Obama in 2008. They were seduced by the slogans “hope” and “change.” They didn’t get hope, they didn’t get change, they were disillusioned. This time they voted for another candidate who is calling for hope and change and has promised to deliver all kinds of amazing things. Well, he is not going to deliver them. So, what happens in a couple of years, when he hasn’t delivered them and that same constituency is disillusioned? That could happen. It’s happened over and over in history with pretty ugly consequences. And whether that could succeed depends on the kind of resistance that will be mounted by people just like you. The answer to this question should be directed to you, not to me.